You might have broken ribs if you are having ongoing pain in the front or back of your rib cage after a significant car accident. Direct trauma to your chest is one of the ways that a crash can cause fractured ribs. In fact, motor vehicle collisions are one of the most common causes of rib fractures, according to the Mayo Clinic. Direct chest trauma from the other vehicle - the other car strikes your body in the chest area. This may be the case if you were a pedestrian or bicyclist. Seat belt – if the impact of the crash hurtles you forward and the seatbelt has to grab you suddenly to hold you in the seat, the force can crack your ribs. Airbag – the force of the airbag can break your ribs. Back seat passenger – if not wearing a seatbelt, the back seat passenger can sustain broken ribs from striking a side door, the back of the front seat, or another object inside the car. Ejection from the car – any unrestrained driver or passenger can suffer broken ribs if the force of the collision ejects them from the vehicle. Pain is usually the only symptom a patient with a rib fracture notices, but this pain can be unlike any other pain you have experienced. Even a “simple” cracked rib can inflict extreme pain when you breathe, move, touch the area, lean against something, or lie down. 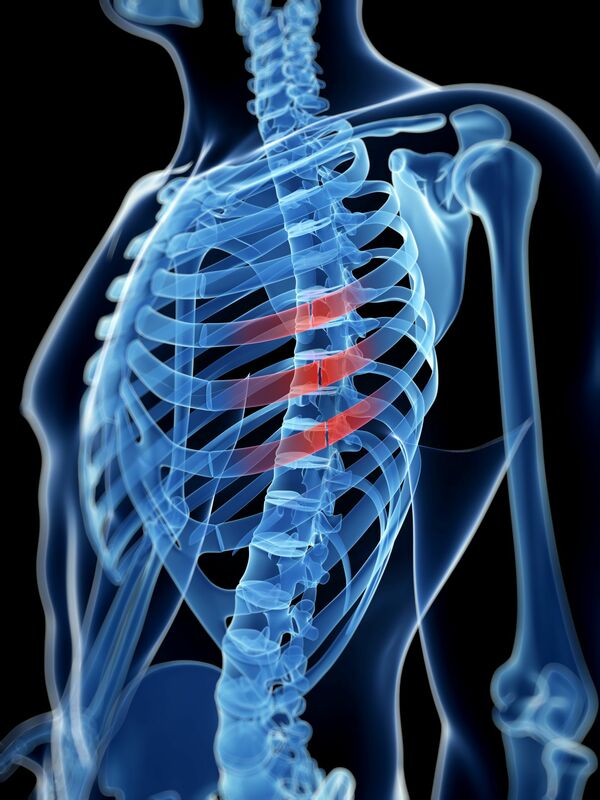 If you experience pain in your rib cage or while breathing, see a doctor right away. Even if your pain is minor, see a doctor after a car accident to identify any injuries that require treatment. If you do not breathe deeply because you are compensating for the pain, you could be at risk of pneumonia, so your doctor may prescribe painkillers. Sometimes doctors have to treat the pain with injections that last longer than oral painkillers. With appropriate pain relief and rest, an uncomplicated broken rib can usually heal on its own. Because your torso must expand and contract when you breathe, doctors do not treat rib fractures with casts. A fractured rib can break into several pieces, which can cause instability of your chest wall. Jagged fragments of bone can puncture your lung, heart, or other internal organs, creating a medical emergency. Force strong enough to break your ribs could bruise or otherwise damage your heart. You might have to undergo surgery to correct rib fracture complications. Again, set up an appointment for an evaluation with a doctor if you were in a car accident. Your medical bills for all reasonable and necessary treatment you need because of the wreck. Income you lost due to time away from work to recuperate from your injuries. Pain and suffering to repay you for the physical discomfort and mental distress you endured. Long-term consequences you are facing from the injury, including reduced earning potential and the costs of ongoing medical procedures and personal care, especially if you suffered serious complications associated with a rib fracture. We can explain these damages in more detail and explore the possibility of pursuing additional damages, depending on the facts of your case and the consequences of your injuries. We will help you sort through the questions and concerns you might have after a car accident. Our team can help you take legal action to recover compensation for damages related to your fractured ribs. Call Max Meyers Law at 425-399-7000 for a free consultation to evaluate your case. We do not charge legal fees unless and until you recover compensation.